Welcome to Titan, the dark moon of Saturn. As a member of PCorp Mining Outfit X9, life is entirely uneventful other than the occasional quarantine due to dust exposure! 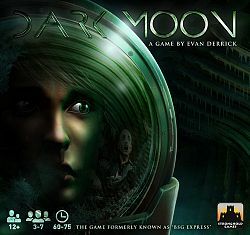 In Dark Moon, players portray blue collar miners working at the edge of space, draining the mineral deposits from Saturn`s largest moon, Titan. But, when an incident occurs, infecting some of the crew with an unknown pathogen, things rapidly spin out of control! Roll dice, point fingers, quarantine players, and (maybe) betray your friends! Will you escape from Titan, or perish on the Dark Moon?